In Montana, an at-large congressional district special election was held on May 25, 2017, to determine the member of the United States House of Representatives for Montana's at-large congressional district. The election was necessitated by Incumbent Republican Representative Ryan Zinke's appointment as United States Secretary of the Interior. Zinke resigned on March 1, 2017, upon his confirmation. Montana's state law required the Governor of Montana to call for a special election to be held no less than 85 and no more than 100 days after the vacancy. Governor Steve Bullock declared a special election to take place on May 25, the earliest possible day he was legally allowed to choose. The Democratic, Republican, Libertarian, and Green Parties held nominating conventions to decide their nominee. The day before the election, Gianforte assaulted a reporter and was charged with misdemeanor assault. At around 10:30pm MST, the election was called for Gianforte after 77% of the votes were counted. The Democratic Party selected a nominee at a convention on March 5. The Bozeman Daily Chronicle from February 4 to 8 conducted a straw poll of Democratic delegates. Of 89 delegates that responded, Rob Quist was selected by 37, Amanda Curtis by 30, Kelly McCarthy by 13, 9 were undecided, and zero delegates selected John Meyer or other. Our Revolution, Progressive political action organization spun out of Senator Bernie Sanders' 2016 presidential campaign. The Libertarian Party Convention on March 11, 2017, was held at Eagle's Lodge in Helena, Montana. Officers of the Libertarian Party of Montana and delegates from the assembled counties had voting rights. Candidate First ballot Pct. Second ballot Pct. Third ballot Pct. The Green Party Convention on March 4, 2017, was held at the University of Montana's Payne Family Native American Center. Breck, along with two independent candidates, won a lawsuit in U.S. District Court against the Montana Secretary of State, ruling Montana's ballot access laws to be unconstitutional in the case of special elections. The District Court Judge ruled to change the original requirement to submit 14,268 ballot petition signatures, reducing that requirement to 400 signatures. The US Court decision failed to provide further remedy and Breck's name was not placed on the ballot despite injunctive appeals to the Ninth Circuit Court and U.S. Supreme Court. Breck subsequently endorsed Independent write-in candidate Doug Campbell who was a co-plaintiff in the suit. During his 2017 Congressional special election campaign, Gianforte relaxed his past pledges to refuse all PAC money, and began to turn away only corporate PAC funding. His campaign began accepting contributions from political party and leadership PACs. The night before the election, Gianforte physically assaulted Ben Jacobs, a reporter from The Guardian, in front of multiple witnesses, knocking him down, punching him, and breaking his glasses. Gianforte was subsequently charged with misdemeanor assault. The editorial boards of the Billings Gazette, the Independent Record, and the Missoulian rescinded their endorsements of Gianforte. The Gianforte campaign released a statement following the incident alleging the incident was caused by, "this aggressive behavior from a liberal journalist", a claim contradictory to the eyewitness account of the Fox News team present in the room at the time. Alicia Acuna, one of two Fox news reporters present, and the only eyewitnesses to the incident, stated that Jacobs had walked into the room, put a voice recorder up to Gianforte's face and began asking questions. She stated that Jacobs, however, showed no sign of physical aggression and did not physically engage Gianforte before being attacked by the Republican candidate. On June 12, following the election, Gianforte was sentenced to community service and fined $385 after admitting the charge. Moveon.org, a progressive public policy advocacy group and political action committee. ^ a b Lutey, Tom (March 1, 2017). "Zinke confirmed as Interior secretary; Montana prepares for special election". Billings Gazette. Retrieved March 1, 2017. ^ Dale Matheson. "13-25-203. Vacancy in office of United States senator or representative". Montana Legislative Services. ^ Mike Dennison (December 19, 2016). "GOP state Senators Buttrey and Sales in the race for Zinke seat". KPAX-TV. MTN News. ^ CNN, Jethro Mullen, May 25, 2017, "'An egregious assault': Twitter erupts over GOP candidate's alleged attack on reporter", Retrieved May 25, 2017. ^ Bobby Caina Calvan (May 25, 2017). "GOP Candidate Charged With Misdemeanor Assault of Reporter". U.S. News & World Report. Associated Press. Retrieved May 25, 2017. ^ "Election Results: Gianforte Wins U.S. House Seat in Montana – Election Results 2017". The New York Times. November 8, 2016. Retrieved May 26, 2017. ^ "Q2 News - Greg Gianforte wins the Montana U.S. House..." Retrieved May 26, 2017 – via Facebook. ^ Mike Dennison (January 25, 2017). "Gianforte officially enters the race to succeed Zinke". KTVH. Retrieved January 26, 2017. ^ "Gianforte wins Republican nomination for Montana's US House election". NBC Montana. Associated Press. March 3, 2017. Retrieved March 3, 2017. ^ Troy Carter (December 18, 2016). "Ed Buttrey becomes first candidate to announce for replacing Zinke". Bozeman Daily Chronicle. ^ Ambarian, Jonathon (January 25, 2017). "Glimm enters race to succeed Zinke in U.S. House". KRTV. Retrieved January 26, 2017. ^ Carter, Troy (January 16, 2017). "Former GOP chair and state senator Ken Miller seeks nomination to replace Zinke". Bozeman Daily Chronicle. Retrieved January 17, 2017. ^ David Erickson (January 6, 2014). "Samuel Redfern: Looking out for veterans, victims of war". Missoulian. Retrieved March 14, 2017. ^ "Redfern announces candidacy for Republican nominee to special election". NBC Montana. March 2, 2017. Retrieved March 5, 2017. ^ a b "Meet The Candidates Vying To Replace Ryan Zinke In Congress". Montana Public Radio. March 2, 2017. Retrieved March 5, 2017. ^ Hudson, Matt (February 27, 2017). "Former Yellowstone County lawmaker enters special Congressional race". Billings Gazette. Retrieved March 1, 2017. ^ a b Carter, Troy (December 20, 2016). "Political newcomer joins growing field of Republicans hoping to replace Zinke in Congress". Bozeman Daily Chronicle. Retrieved March 1, 2017. ^ Mike Dennison (January 23, 2017). "Zinke confirmation not yet scheduled; Turiano enters race to succeed him". KPAX-TV. MTN News. ^ "The Latest: GOP field for Montana US House race narrows to 6". Bozeman Daily Chronicle. Associated Press. March 2, 2017. Retrieved March 5, 2017. ^ a b Lutey, Tom (December 19, 2016). "Republicans line up to run for Zinke's open seat, Democrats not so much". The Billings Gazette. ^ Lutey, Tom (January 10, 2017). "District Judge Fagg won't seek U.S. House seat". Billings Gazette. ^ Drake, Phil (February 5, 2017). "Gianforte, Curtis front runners for Zinke seat, expert says". Great Falls Tribune. Retrieved March 1, 2017. ^ "Sales decides against run for Congress". Great Falls Tribune. February 21, 2017. Retrieved March 1, 2017. ^ Dana Liebelson (December 16, 2016). "White Nationalist Who Yelled 'Hail Trump!' Thinking About Congressional Run". The Huffington Post. ^ Doherty, Brian (December 28, 2016). "Libertarian-leaning Montana State Rep. Daniel Zolnikov is Thinking About Montana's One Federal House Seat". Reason. Retrieved December 29, 2016. ^ Daniel Zolnikov [@DanielZolnikov] (January 27, 2017). "FYI #mtnews, I sent a letter to Republican state central committee members last week informing them I'm not running" (Tweet). Retrieved March 1, 2017 – via Twitter. ^ "Montana Democrats Announce Special Nominating Convention March 5". Montana Democratic Party. March 1, 2017. Retrieved March 1, 2017. ^ a b Troy Carter (February 12, 2017). "Poll: Insiders show stronger support for Dems with name recognition". Bozeman Daily Chronicle. Retrieved March 1, 2017. ^ a b Bobby Caina Calvan (March 5, 2017). "Rob Quist wins Democratic nomination for congressional seat". Great Falls Tribune. Associated Press. ^ Lutey, Tom (January 4, 2017). "Democrat Amanda Curtis interested in U.S. House; Fagg, Graf join Republican list". Missoulian. Retrieved January 7, 2017. ^ Carter, Troy (January 6, 2017). "Enviro attorney in Bozeman becomes 5th to seek Dem's nomination for U.S. House". Bozeman Daily Chronicle. Retrieved January 24, 2017. ^ Ouellet, Nicky (February 7, 2017). "A Sixth Democrat Enters The Race For Zinke's House Seat". Montana Public Radio. Retrieved February 7, 2017. ^ Briggeman, Kim (February 13, 2017). "Sentinel teacher to seek Democratic nomination for U.S. House". Missoulian. Retrieved March 1, 2017. ^ Loranger, Erin (February 23, 2017). "Helena Democrat Weida to join race for Zinke's seat". Independent Record. Retrieved March 1, 2017. ^ Kosted, Nathan (February 6, 2017). "Dan West: Democratic Candidate for Congress". Intelligent Discontent. Retrieved February 7, 2017. ^ Mike Dennison (January 13, 2017). "Baucus' son considering U.S. House race, while musician Quist is all in". KPAX-TV. MTN News. ^ Robinson, Joshua (January 23, 2017). "Juneau: I will not to pursue MT Congress seat". KULR-TV. ^ Whitney, Eric. "Curtis In, Juneau, Schreiner Out Of Race For Zinke's Seat". Montana Public Radio. ^ Kelly McCarthy [@Kelly4MT] (January 25, 2017). "Thank you @Robyn_Driscoll 'I am proud to endorse Kelly as he seeks a nomination to run to represent Montana in Congress.'" (Tweet). Retrieved March 5, 2017 – via Twitter. ^ Kelly McCarthy [@Kelly4MT] (February 4, 2017). "Fmr. Senator Cliff Larsen Friday. 'Congress could learn a little more about leadership and a whole lot about sacrifice from Kelly.'" (Tweet). Retrieved March 5, 2017 – via Twitter. ^ Carter, Tory (January 27, 2017). "John Rogers backs Rep. McCarthy for Dems nomination". Bozeman Daily Chronicle. Retrieved March 5, 2017. ^ a b c "Endorsements". Rob Quist for Montana. Retrieved March 5, 2017. ^ a b Carter, Troy (January 5, 2017). "Former Gov. Schweitzer on the bandwagon for musician Rob Quist's congressional bid". Bozeman Daily Chronicle. Retrieved March 1, 2017. ^ Watts, Reggie (February 28, 2017). "Thank You, Reggie Watts for your support!". Retrieved March 1, 2017 – via Facebook. ^ a b Calvan, Bobby Caina (March 11, 2017). "Libertarians Pick Inverness Rancher for Congressional Race". U.S. News & World Report. Associated Press. Retrieved March 11, 2017. ^ Carter, Troy (January 4, 2017). "Libertarian Mark Wicks says he'll run for House to replace Zinke". Bozeman Daily Chronicle. Retrieved February 7, 2017. ^ a b c d e f g Jonathon Ambarian. "Montana Libertarians select Wicks as nominee for U.S. House seat". KTVQ. MTN News. Retrieved March 12, 2017. ^ a b c d Carter, Troy (January 27, 2017). "Montana Libertarian Party to convene ahead of special election". Bozeman Daily Chronicle. Retrieved February 7, 2017. ^ a b Bubnash, Kasey (March 4, 2017). "Montana Green Party holds first statewide convention in 10 years". Missoulian. Retrieved April 7, 2017. ^ Wadley, Will (April 10, 2017). "Sec. of State: no change to candidate names on special election ballot". KECI. Retrieved May 25, 2017. ^ "Court Order" (PDF). Retrieved May 25, 2017. ^ "Montana Green Party Candidate Endorses Independent Write-in Candidate Doug Campbell in Special Election Race". Thomas Breck for Congress. April 25, 2017. Retrieved May 25, 2017. ^ Wong, Julia Carrie; Levin, Sam (May 24, 2017). "Republican candidate 'body-slams' Guardian reporter in Montana". The Guardian. ISSN 0261-3077. Retrieved May 25, 2017. ^ Julia Carrie, Wong; Levin, Sam. "Republican candidate charged with assault after 'body-slamming' Guardian reporter". theguardian.com. The Guardian. Retrieved May 25, 2017. ^ "Gianforte cited for misdemeanor assault". KRTV Great Falls. KRTV. Retrieved May 25, 2017. ^ Grunwald, Michael. "Three Montana newspapers rescind Gianforte endorsements after alleged body-slamming incident". Politico. Retrieved May 25, 2017. ^ McBride, Jessica (May 5, 2017). "READ: Greg Gianforte Statement on 'Body Slam' Claim". Heavy.com. Retrieved May 26, 2017. ^ "Greg Gianforte: Fox News team witnesses GOP House candidate 'body slam' reporter". Fox News. May 24, 2017. Retrieved September 27, 2017. ^ Wong, Julia Carrie; Levin, Sam (June 12, 2017). "Greg Gianforte sentenced to community service for assaulting Guardian reporter". The Guardian. Retrieved June 12, 2017. ^ Diaz, Daniella (May 24, 2017). "First on CNN: Trump records robocall for Montana special election". CNN. ^ Steve Daines [@SteveDaines] (March 6, 2017). "Greg Gianforte will stand up for Montana values in Washington" (Tweet) – via Twitter. ^ "Vice President Mike Pence coming to Billings to campaign for GOP candidate Greg Gianforte". Associated Press. May 8, 2017. ^ Ryan Zinke [@RyanZinke] (March 6, 2017). "Congrats to @GregForMontana. I'm looking forward to calling you Congressman!" (Tweet) – via Twitter. ^ "Sheriff David Clarke for Greg Gianforte - Great America PAC". YouTube. April 20, 2017. Retrieved September 27, 2017. ^ Kuglin, Tom (May 4, 2017). "Donald Trump Jr. returning to Montana to campaign for Greg Gianforte next week". The Missoulian. ^ "Crow Tribe endorses Greg Gianforte for Congress". Matt Hudson. May 19, 2017. ^ "NRA Endorses Greg Gianforte for Montana's Special Election to U.S. House of Representatives". The National Rifle Association Political Victory Fund. March 28, 2017. ^ "Small Business Endorses Greg Gianforte in Special Election for Congress". NFIB. May 16, 2017. ^ "Gun Group Endorses Gianforte". MSSA. May 11, 2017. ^ a b c Cates-Carney, Corin. "Three of Montana's Largest Newspapers Endorse Gianforte For US House". Montana Public Radio. Retrieved May 15, 2017. ^ The Billings Gazette Editorial Board (May 24, 2017). "Gazette opinion: We're pulling our endorsement of Gianforte". The Billings Gazette. Retrieved May 24, 2017. ^ "Independent Record withdraws endorsement of Gianforte". Independent Record. Helena Independent Record. Retrieved May 25, 2017. ^ "Missoulian rescinds Gianforte endorsement". The Missoulian. Retrieved May 25, 2017. ^ "MT-AL: Sen. Al Franken (D. MN) Helps Populist Rob Quist (D) Get Ready For A Big Win On Thursday". Daily Kos. May 23, 2017. ^ "MT-AL: Sen. Catherine Cortez Masto (D. NV) Helps Rob Quist (D) Get Ready For A Big Win On Thursday". Daily Kos. May 23, 2017. ^ Kaufman, Alexander (April 17, 2017). "Bernie Sanders Throws His Hat In With Montana Populist Rob Quist:". Huffington Post. ^ Bernie Sanders [@aseitzwald] (April 17, 2017). "Bernie Sanders backs Rob Quist:" (Tweet) – via Twitter. ^ Jon Tester [@jontester] (March 5, 2017). "My statement on the nomination of Rob Quist as candidate for U.S. House of Representatives" (Tweet) – via Twitter. ^ "MT-AL: Sen. Jon Tester (D) Gives Rob Quist (D) A Big Boost Before Thursday's Election". Daily Kos. May 20, 2017. ^ Elizabeth Warren [@elizabethforma] (May 25, 2017). "Happy Election Day, Montana! Go vote for @RobQuistforMT if you haven't already. Look up your polling place: iwillvote.com/ #mtal" (Tweet). Retrieved May 25, 2017 – via Twitter. ^ "With only one representative in Congress, it's critical we have a voice for all Montanans. Rob Quist can be that voice, and I have no doubt he will run to win and will put our state's interests above his own. I congratulate Rob on the nomination". Steve Bullock. March 5, 2017. ^ Governor Bullock for Quist. Team Quist Information. May 24, 2017 – via YouTube. ^ Rob Quist [@RobQuistforMT] (April 18, 2017). "Thanks to Mayor of Bozeman Carson Taylor for introducing me in Bozeman this weekend. I had a great time at the office opening" (Tweet) – via Twitter. ^ a b "Montana Dem boosted by some celebrity donations". TheHill. Retrieved May 26, 2017. ^ Rob Quist [@RobQuistforMT] (January 10, 2017). "Thank you @MichaelKeaton for the support in this election! Montana, side with Batman—vote this Thursday, May 25!" (Tweet). Retrieved May 25, 2017 – via Twitter. ^ Alyssa Milano [@Alyssa_Milano] (April 27, 2017). "University of Montana! I'm here! Meet me at The Oval at 10am and I will drive you to early vote! Let's do this. #teamquist #robquist" (Tweet). Retrieved May 25, 2017 – via Twitter. ^ "Cecile Richards for Rob Quist". YouTube. Retrieved September 27, 2017. ^ "MEA-MFT COPE endorses Rob Quist for Congress". Eric Feaver. March 24, 2017. ^ Montana State AFL-CIO [@MTaflcio] (March 22, 2017). "Mont AFL-CIO endorses Rob Quist for Congress. "Quist is a homegrown Montanan & understands the challenges working people face" #1u #mtpress" (Tweet). Retrieved May 25, 2017 – via Twitter. ^ Jim Dean (March 29, 2017). "DFA backs Rob Quist in Montana At-Large Special Congressional Election". Democracy for America. ^ "End Citizens United Endorses Rob Quist for Congress". Press Releases. April 21, 2017. ^ "LCV Action Fund Endorses Rob Quist for Congress". Craig Auster. April 5, 2017. ^ "MCV Endorses Rob Quist for U.S. House". Montana Conservation Voters. March 27, 2017. ^ "Montana Sportsmen Alliance endorses Rob Quist". Cassidy Belus. April 24, 2017. ^ "NARAL Endorses Pro-Choice Leader for Congress in Montana". NARAL Pro-Choice America. April 20, 2017. ^ "We Must Protect Social Security and Medicare". Rob Quist for Congress. April 21, 2017. ^ Northern Cheyenne Tribe Endorses Rob Quist in Billings, MT. Uphill Media. May 21, 2017 – via YouTube. ^ Our Revolution [@OurRevolution] (March 20, 2017). "Two huge endorsements! We're supporting @RobQuistforMT and @JamesThompsonKS in their campaigns for U.S. Congress!" (Tweet) – via Twitter. ^ Nir, David (March 9, 2017). "Daily Kos endorses Rob Quist, populist outsider, for Montana's special election for the House". Daily Kos. Retrieved March 9, 2017. ^ Stewart, Brian (March 21, 2017). "MoveOn Members in Montana Endorse Inclusive Populist Rob Quist for U.S. House, Vowing to Take ACA Fight to the Ballot Box". Moveon. ^ "News & Events". Wicksforfreedom.com. June 20, 2014. Retrieved September 27, 2017. 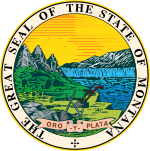 ^ "Montana Secretary of State". mtelectionresults.gov. Retrieved May 26, 2017.